This tour, with it's terrain, will stun you. Desert, sagebrush, mountains, plateaus, wheat fields, apple orchards, and a landscape of gouged-out earth is incredible to see. Formerly flat land, the earth is just gone, and a valley lays far below, with lakes, the left overs of former massive flooding. 12 hours, you'll love this tour. Lunch and snacks included. 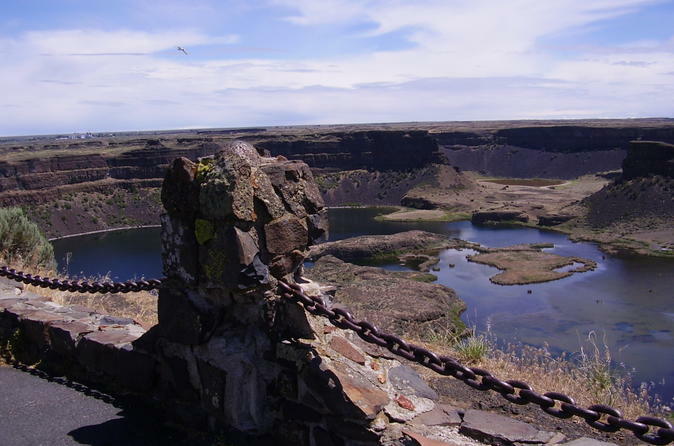 On this tour, you'll leave the Seattle area with a driver/guide in our SUV and cross a mountain pass on your way to Dry Falls, a geological wonder. You'll stop for lunch on the way (included). Your guide will share the region's history and heritage on the way to Dry Falls, where you stop and take in the massive flood results -a mini Grand Canyon. This tour involves a drive through an area in Central Washington that was flooded over and over during the ice age when an ice dam kept breaking, causing massive flooding here. Beautiful terrain, and very different. A must see of the Great Pacific Northwest. See orchards with fruit of the season: Apples, Cherries, Apricots, Plums, Pears, and more. See farms and vineyards, with potatoes, hops, and grapes. Also Rivers, Mountain Passes, a temperate climate, a semi-arid climate, and the amazing landscapes of the Coulees and Dry Falls.